PERIOD OF RECORD.--Stage-only records from October 1999 to current year. GAGE.--Water-stage recorder. Datum of gage is 763.00 ft above National Geodetic Vertical Datum of 1929. 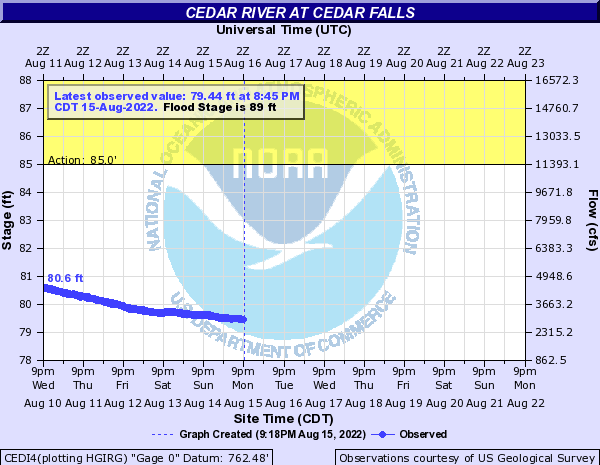 Prior to July 13, 2012, daily gage height values of <83.10 ft indicate stage was at or below this minimum detection stage. PERIOD OF RECORD.--Water years 1974-1979, 1984-1985, 1987-1995, 2001-2002, 2011-2012. Period of record includes water-quality data published in USGS annual reports and various project reports.